Hello Friends! This is your astrologer Punit Pandey. I am returning back on AstroSage TV after a long time and today I want to bring an amazing video to you. Today's topic is "Learn KP System of in 5 minutes". This is going to be a path-breaking video and I believe that something like this has never appeared on Internet before. After watching this video, astrology enthusiasts will be able to utilize astrology to decide their day to day matters. Astrologers will also benefit from this video as their prediction accuracy will increase many-folds. There are many systems in astrology like parashari, jaimini, tajik, western, kp astrology, lal kitab etc. and among these KP System or Krishnamurti Paddhati is considered one of the most easy to apply and most accurate system of present time. When will one get married? When will one get job? When it will rain today? When will power return back? these are some most important questions of daily life and KP System is an excellent system to answer such questions. If somebody tells you that you will get married on so an so date. Or if somebody tells you that your child who has gone to school will return precisely on x hour y min and z seconds, you will be surpized. This is the beauty of KP System and after 5 mins you will be able to do it yourself. People will charge thousands of rupees to tell this to you and still they will tell you only modified and corrupted version. They will not tell you the true version. I am telling you simple, non-corrupted, and precise version of KP System in the language you can understand. I am happy that I am able to bring this episode live with the help of AstroSage TV. So let's begin. Rule No. 1. Other than its own results, a planet also gives the results of its nakshatra lord. Rule No. 2. 12th house from any house negates the results of that house. Rule No. 4. Sub Lord of a planet qualify the results of the planet. Without planet's sub lord permits, planet will not be able to give results. Rule No. 5. Cuspal sub lord tells you whether the event is promised or not. Let us start with Rule 5 first. What is that rule? Rule is "cuspal sub lord tells whether the event is promised or not". In astrology, Seventh house is the parimary house for marriage. You probably already know it. In our example chart, Seventh Cuspal Sub Lord is Saturn situated in the 12th house of isolation and separation. Saturn owns 6th house which house of marriage seperation and divorce. Why? Why is the 6th house, a house for divorce and seperation? The answer lies in the rule second. Remember that - "12th house from any house negates the results of that house. " 7th house is the house of marriage, so 12th from the 7th house i.e. 6th house is the house of seperation, house of divorce. Second rule is very important for predictive purpose so one must always remember it. Coming back to the question of promise, now it is clear that the chart shows promise of divorce because cuspal sub lord of 7th house owns 6th house and occupies 12th house. You would ask that you are talking about divorce, what about the promise of marriage? Was marriage promised in this chart at all? How she got married if the chart promises divorce? Now the rule 1. comes into picture. What was the rule no. 1.? "a planet, other than its own results, gives results of its nakshatra lord". Planet and Planet's nakshatra lord's results are collectively called signification of the planet in KP astrology. So when we have to see promise of marriage, we have to see not only placement of Cuspal Sub Lord of 7th house, we also need to see nakshatra lord of the planet. In our example chart, Saturn is situated in Mercury's Naksahtra. Mercury owns 2nd house of family and 11th house of fulfilment of desire. 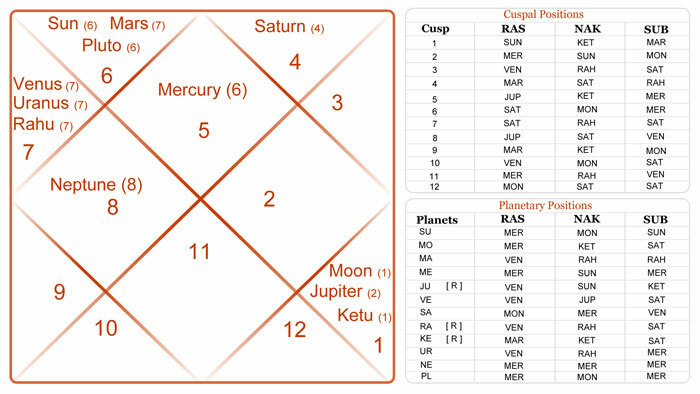 So, as 7th cuspal sub lord is situated in the nakshatra of Mercury, it promises marriage. Due to Saturn's connection with 6,12, chart shows divorce and due to Saturn's connection with 2,11, chart shows marriage. Both the promises are there. I hope now you understand how to predict what events are promised in a chart. Another important question in life is of 'when'. Let's see how to find out when was the native got married? Listen carefully, because once you understand it, you will be able to predict timing of all major events of your life like job, marriage, disease etc. To answer this question of marriage timing, we need to remember rule no. 3 which says "results are decided by not a single house but a group of houses". For example, marriage happens when one gets dasa of planet connected with the houses 7th which is the house of marriage, 2nd which is the house of family and 11th which is the house of fulfilment of desire. So unlike classical approach, where 7th house is given more prominence, in KP house group is given importance. For marriage house group is group of 2nd, 7th and 11th houses. The list of house groups for various events of life is given on KP astrology wiki (http://kpastrology.astrosage.com) and you can use for predicting other events of life. Coming back to the marriage, Marriage happened in June 2002 when the mahadasa of Sun and Antardasa of Mercury was running. Sun is situated in 2nd house which is one of the houses in the house grouping 2,7,11 for marriage. Mercury owns 2nd and 11th house, two houses in the house grouping and hence Mercury is also capable of giving marriage. No wonder person got married in Sun mahadasa and Mercury antardasa. Before I close, I want to remind that KP System follows calculations which are slightly different than traditional astrology. For example, KP uses Western style of house division and KP Ayanamsa. So for all calculations, you can use www.AstroSage.com, www.MyKundali.com which gives calcualations according to KP. I hope you enjoyed this video. Till next time, bye bye. Happy Learning.